The surface dust test is performed after air blowing on the blast-cleaned surface (SSPC-SP 10, SSPC-SP 5, etc.) and is done based on procedure outlined on ISO 8502-3 to ensure all dust and grit being removed from the surface. After completion of sandblasting, the surface is normally subjected to the 90-120 psi air blow by the proper air compressor. If dust remains on the surface can reduce the paint adhesion and subsequently by absorbing moisture promotes the corrosion (under the coating) and cause coating failure. A specific, clear adhesive tape (pressure-sensitive) is used for this purpose. The tape is mounted on the spring loaded roller and tape is pressed on the selected spot with 39.2 N load ( load is adjusted based on tape manufacturer instruction). Subsequently, the tape is pulled from the surface and adhered to the displaying board. The tape indicates a pattern of adhered dust to the surface and is compared with the pictorial figure provided on ISO 8502-3. 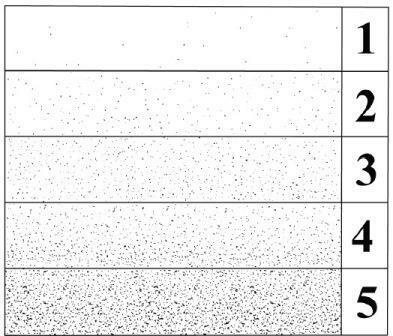 The quantity of the dust classified 1 thru 5 with 1 as lowest dust and 5 with the highest amount of dust. The acceptance class depends on the customer coating specification but normally 2 is an acceptable level and 3, 4 and 5 are subjected to cleaning and re-test. The ISO 8502-3 also classifies the dust particle size but normally is not a requirement in coating specifications. Class 1 dust size not visible with 10X magnification, Class 2 dust size can be seen by 10X magnification, class 3 dust size can be seen by normal vision (without magnifier), class 4 dust size is 0.5 mm thru 2.5 mm, and class 5 is greater than 2.5 mm.